Show your True Blue spirit. 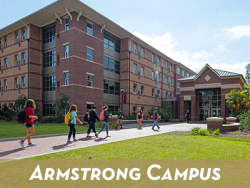 The Armstrong Bookstore is a partnership between Auxiliary Services and Follet Higher Education Group. 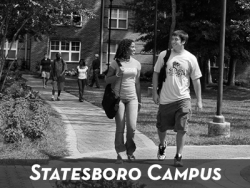 They provide the Armstrong and Liberty campuses of Georgia Southern with textbooks, supplies, technology solutions, licensed merchandise and more. About Follet: Follett provides you with access to products and services from their huge network of bookstores and carefully-selected vendor partners across the country, and from their state-of-the-art distribution center. New or used, rentals or eBooks – Armstrong Bookstore offers tons of options! Financial aid is also accepted as payment. The Armstrong Bookstore has basic school supplies like backpacks, binders, pens, pencils and scantrons. They also carry class and major-specific supplies including study guides, lab coats, goggles, sketch paper and portfolio holders. Nothing says “True Blue” like sporting your favorite spirit items! 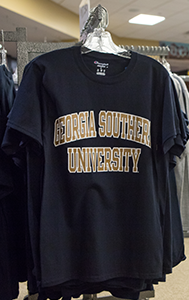 Armstrong Bookstore carries a variety of licensed GS merchandise.